Hi. I need an easy 1 minute long choreography idea (modern or jazz). I don't normally dance, but I need to prepare something to get into a musical theatre school. You know, to show that I can learn, even though I haven't really danced much. Contemporary dance is a very free dancing form. You can create your own movements, because there is not a rule that establishes a limited choreographic vocabulary. However, if you don’t feel like you can do it, you are a beginner, don’t have experience on dance composition, or don’t have a teacher or friend that may help you to make a choreography, you can start by picking ideas from other people’s choreographies. Nowadays, the easiest way to find ideas for choreography is searching on the web. So, I just did this for you in a very fast way, just to show you an example. I typed ‘easy contemporary dance choreography ideas’ in the Youtube’s search box, and I got a list of results. Off course, everything that appears there will not fit what you’re looking for. So now, your work is to watch the videos patiently till you find something that works for you. If you feel that there’s nothing there, just try with another keyword-phrase in the search box, and watch the results. There are many styles in contemporary dance. The one you see in the example above is very much influenced by modern or even balletic shapes, which is an American trend. 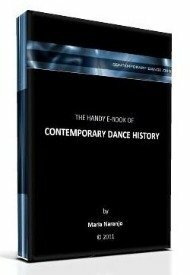 In European contemporary dance you can find many other different shapes and dynamics. Just take yourself the time to do some research.